In what has become a venerable tradition at the College of Charleston, the Halsey Institute of Contemporary Art presents Young Contemporaries 2018. Now in its 33rd year, the exhibition features work by College of Charleston students juried by a nationally prominent juror. The exhibition reflects the strength and diversity of practice in the School of the Arts’ rigorous programs. 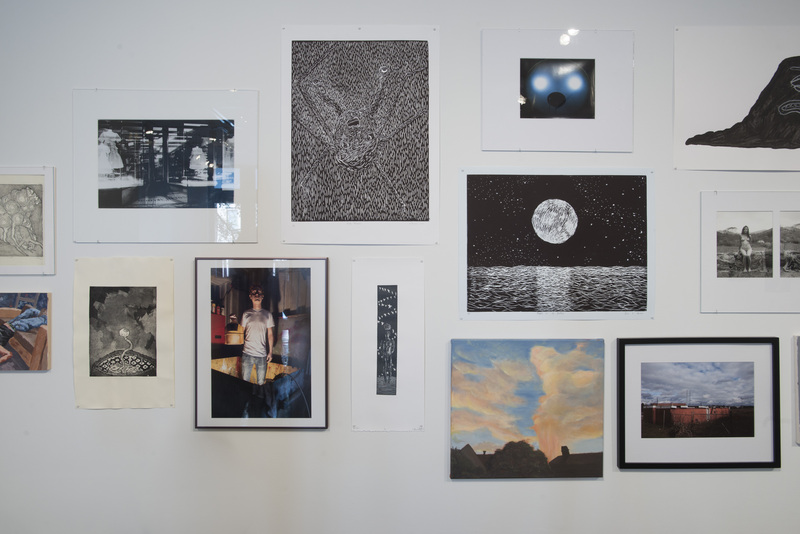 Featuring a wide range of media—including paintings, sculpture, photography, and prints—the exhibition showcases the talent of the student body at the College. For 2018, Amy Yoes serves as the juror. Concurrent with Young Contemporaries will be the Salon des Refusés exhibition, showing in the exhibition space of the Simons Center for the Arts. The works in the Salon were chosen by Studio Art faculty. The origin of the Salon des Refusés dates to Paris in 1863, when artists who had been rejected from the official Salon caused such a protest that Emperor Napoleon III ordered another exhibition held for them. Among the painters in this Salon des Refusés were Camille Pissaro, Henri Fantin-Latour, James M. Whistler, and Edouard Manet. Her videos have been seen in many venues, including the National Gallery of Art, Washington, DC. ; MassMoca, North Adams, MA; and the Wexner Center for the Arts, Columbus, Ohio. She has held residencies at the Maison Dora Maar, Ménerbes, France; AIR, Krems, Austria; McDowell, Peterborough, NH; Yaddo, Saratoga Springs, NY; and The British School at Rome, Italy. She has been a visiting artist at many institutions, including the School of the Art Institute of Chicago, University of Las Vegas Nevada, Maryland Institute College of Art, and the Siena Art Institute. Recent projects include a site-specific animation installation at the Sullivan Galleries at the School of the Art Institute of Chicago and a new animation for a screening at the National Gallery of Art. For more information visit www.amyyoesprojects.com. CofC Fall 2017/Spring 2018 students (including recent Dec. graduates) can register submissions at the Halsey Institute. Up to three works per artist, per medium, allowed. Award ceremony at 6:00 PM. Works must be dropped off at the Halsey Institute (in Cato Center for the Arts, 161 Calhoun Street) during this time. You must be present with your artwork in order to sign off on the Conditions for Submitting contract. CofC Fall 2017/Spring 2018 Students including December 2017 graduates. Original artwork completed between April 2017 – March 2018. Students may submit up to three pieces per artist, per medium (prints, sculptures, etc.). Fill out labels legibly and attach to the back of EVERY artwork submitted. Indicate on the label if there are any special installation instructions. Bring eligible work to the Halsey Institute on Friday, March 9, 10am-5pm. You must bring your own work yourself. Oversized work must also be registered at this time, even if it will be delivered later. Indicate on the registration form if you have oversized work, where it is located, and attach a picture or photocopy of it. ALL WORK MUST BE DRY! Contact Bryan Granger, Manager of Exhibitions and Public Programs, at grangerbw@cofc.edu. To print this out in PDF format, click here. For labels to affix to your artwork, click here.